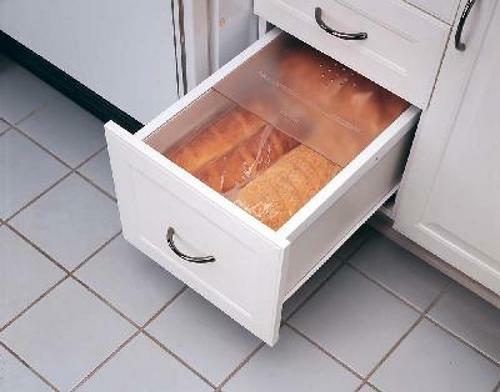 Rev-A-Shelf Bread Drawer Covers come in three color finishes. The cover is textured to hide scratches and has vented opening for air circulation with molded in handle. 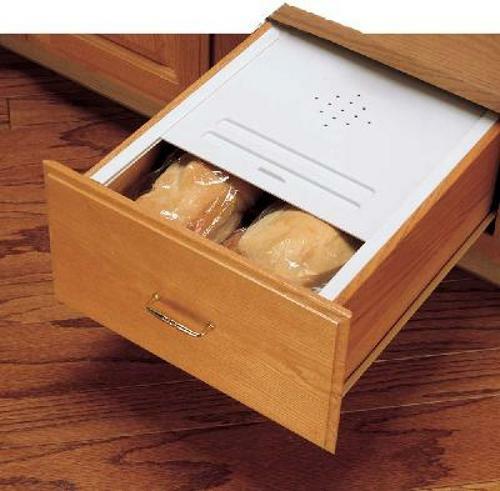 Comes in two sized that can be trimmed to accommodate common drawer dimensions. The kit contains one-piece cover with handle and rear stop molded in, plus height adjustable sliding rail kit, mounting screws. Kits contain one-piece cover with handle and rear stop molded in, plus height adjustable sliding rail kit, mounting screw and instructions. Kits contain one-piece cover with handle and rear stop molded in, plus height adjustable sliding rail kit and mounting screws. 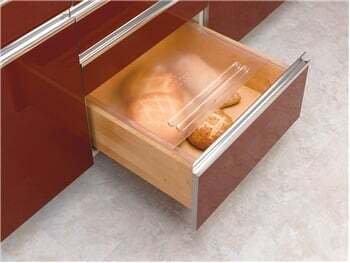 Kit contains one-piece cover with handle and rear stop molded in, plus height adjustable sliding rail kit, mounting screws for base cabinet drawers. Attractive textured finish that hides scratches.